Every year Americans spend some $20 billion on cut flowers, many that are produced with the heavy use of chemicals, which can wash off into waterways, kill fish and work their way up the food chain. One study found as many as 127 different pesticides in flowers from Colombia, including highly toxic chemicals banned in the United States. Similar serious pesticide problems have been documented in Kenya, which has developed an enormous cut flower industry. Numerous studies have also linked pesticides to serious health problems among flower workers, some of whom are exposed to upward of 100 types of pesticides on the job. But the market for organic flowers is growing, and a third-party certification program called VeriFlora now guarantees that flowers stamped with its seal are sustainable and labor-friendly. Though still a small part of the total U.S. flower market, the Organic Trade Association says that sales of “green” flowers have increased by as much as 50 percent a year in the last decade. That’s something to think about next time you feel like brightening up someone’s day with a bouquet. The market for organic flowers is growing, and a third-party certification program called VeriFlora now guarantees that flowers stamped with its seal are sustainable and labor-friendly. Search for “organic flowers” online. Urge your supermarket to sell organic flowers—or buy from them if they already do. Buy certified flowers from your local florist or ask them to sell local flowers to cut gas-guzzling flights from South America. Frequent local farmers’ markets—often they are on the leading edge of environmentally sound practices. Give organic seeds for planting instead. What inspires you to help wildlife? Many years ago I hit a coyote that ran into the road. I actually wrapped him in a blanket and put him in one of my horse stalls. Not very smart, I know. But I had to do it. The man I called to take the coyote told me what he did and how he helped. The next week I was taking the test to become a wildlife rehabilitator, and I have never looked back. What do you do in your daily life to protect wildlife? 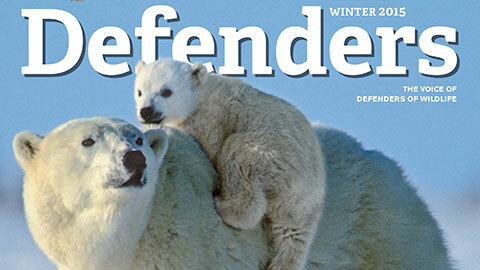 Write to us at editor@defenders.org and your idea and photo could be featured on this page in a future issue.